Leabank Square Extremely Disappointed with Olympic Architects!! Take a look at the picture above - you are going to be so sick of looking at it for the next couple of decades!!! This is the best the Olympics could come up with as part of OUR legacy!!!!! This is the reward we have been given for giving them OUR beloved green lung - Arena Fields!!!! Thanks to everyone who has sent me comments, emails, letters, had chats in the gardens, etc! There is not a single resident of Arena Fields (nor Wick Village next door!!) 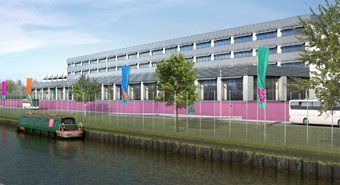 who likes the design for the International Broadcast Centre & Main Press Centre! Again - Hackney Wick has been dumped on by the Olympic Delivery Authority! We have always been seen as the poorest neighbour of the whole Olympic Park - and their attitude is that we should be grateful for anything we get. Well - we had a perfectly beautiful green park in Arena Fields directly opposite us - and now we have two massive blocks of steel & glass instead. My children's lego creations have more imagination, beauty & practical use - than what Hackney Wick is going to get as a legacy! I was at a meeting last week where a suit from the Olympics was telling us that the buildings 'will come alive' when the cladding is put on. Putting all your suggestions about living walls to him - he nearly passed out! Leabank Square - he's 'not sure' about living walls - but how about a nice greeny/greyee dappled metal finish?! So - they took away Arena Fields - with our orchard & trees - and gave given us two massive glass & steel blocks - and won't even consider cladding them in beautiful green, living, growing plants?! "The architecture as shown is extremely weak, lacking real conviction as to how it could work in Transition and Legacy, and in the case of the IBC revealing a paucity of imagination and analysis which we find deeply disappointing. And guess who the Olympic Delivery Authority need to submit the plans to in order to get permission to carry this architectural monstrosity forward? Themselves! That's right Leabank Square! The Olympics give themselves permission to build anything they want on our Arena Fields! Hackney Council has no say. Boris Johnson has no say. Meg Hillier has no say (not that she ever does!). Gordon Brown has no say. The Olympics decide what is best for us oiks across the canal to stare at for the next 50 years. And the picture above is the best they've come up with! 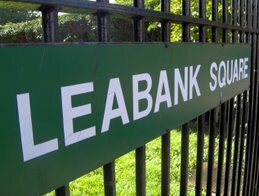 Public meeting to discuss how Leabank Square can be involved in this year’s Festival programme. Please come along to share your ideas and find out how to get involved. As we all know - the 5th June each year - is World Environment Day! This year the Olympic people are going to help us celebrate it by supporting a few projects we may want to do in Leabank Square!! We need as many ideas as possible to put forward to them (mainly Carrillion Construction Company) to consider. The theme is as broad as the environment. If we want them to help out in the gardens, make use of some of their people & machines, donate items we think would reduce our carbon footprints, create a safari park on our green - all we have to do is ask! Of course, they might not immediately start importing herds of elephants for Leabank Square - but they are willing to consider anything we might propose! So........... Leabank Square - please get your thinking caps on - and come up with some brilliant ideas for us to celebrate World Evironment Day this year!! Competition to Design Artwork for Arena Fields Olympic Portakabins!! Our mates over the canal have come up with a super way of making our view of the Arena Fields Olympic Welfare Centre a bit better! They are going to have a competition to see which talented junior artists will design the artwork to go onto the sides facing Leabank Square! 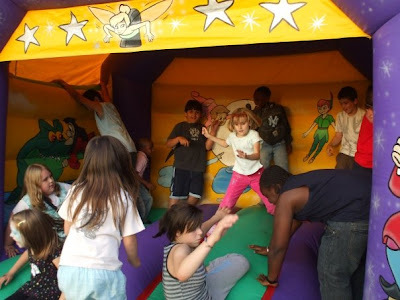 Leabank Square - please get as many of our children along to the Hackney Wick Community Centre (Old Baths in the Eastway) - as soon as they give us a date. They are going to host an art workshop for the kids to get their creative juices flowing. We need as many amazing designs as possible to be considered for the competition. The winners will have the privilege of seeing their art super-imposed onto giant meshes - and hung in front of the welfare centre for a long time for the rest of us to admire!! About an hour ago - all the Olympic site construction workers suddenly dropped everything & legged it away from our shared canal!! A few minutes afterwards - the police arrived here in Leabank Square and ordered us all away from the windows overlooking the Olympic site. An unexploded bomb along the fence here at Leabank Square. It is in exactly the spot that we planted the fig tree about 10 years ago!!! After all the hoopla about building the electric fence all around the Olympic Park - there was a bomb about a meter inside the perimeter fence all along. This is the same fence that all the bull dozers, massive trucks, huge diggers - not forgetting all the Leabankers who planted our much missed & always loved orchard! Anyhow - it might take a while before they sort it out - so sit tight Leabank Square - and if you hear a bang - check the canal for any leaks!! Thanks to all the brilliant residents - the Riverbank in Leabank Square is really looking better each Spring day! We are going to have a great Summer here in Leabank Square - and the Riverbank is going to look stunning!! So many Leabankers have helped out with all the carrying, planting, painting, seeding, watering, tidying, decorating, etc to mention anyone by name - but all the kids have put the rest of us adults to shame by doing so much of the very hard work!! Leabank Square Takes Part in the Hackney Wick Sunflower Avenue!! 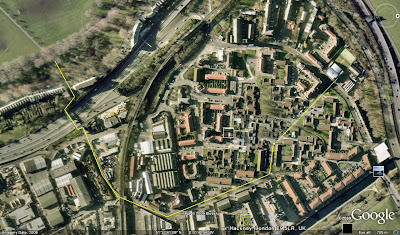 This summer - you are going to be able to walk all the way from the Hackney Wick Community Centre in the Eastway - down Osborne Road, along Berkshire Road, past Leabank Square, along Wallis Road, and over the footbridge into Viccie Park - with beautiful Sunflowers smiling at you all the way!!!! This year is the first annual Hackney Wick Sunflower Avenue display!!!!!!!!! 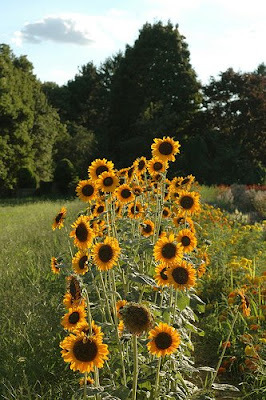 Please talk to all you friends & neighbours - and get them to plant sunflower seeds everywhere along the avenue. We want to get thousands of these amazingly happy flowers growing all along the route - just cos it makes us all feel good. Imagine how beautiful it is going to look with a stunning river of yellow running past Leabank Square! Every time you pop out for a walk - you will be accompanied by sunflowers!! Leabank Square Thanks Owen Beith!! We are all familiar with Owens words of wisdom, his amazing clarity when helping us through a problem, his short-cuts when we need help with political advice, his incredible knowledge of all fauna & flora - but over the past few months - he has been helping us out in another beautiful way! Today he donated a lovely peach tree, a few weeks ago a fine Dogrose - and just before that - some fine specimens of Honeysuckles (the yellow & cream ones!) which have all been planted up on the river bank. These are all going to make our river bank look absolutely stunning this summer - just in time for us to invite Owen down for a (veggie) barbie!! Owen - thank you for all your kind donations to our gardening club - you are truly the best friend we have!! Get Your Free Seeds From BBC Dig In!! The sad old man that I am - there is nothing better that I love - than watching Gardeners World on a Friday Evening at 8pm!! The BBC team are so very clued up on all aspects of gardening - though I could do without the flowers bit - food gardening is more my cup of cocao. But this evening they launched a brilliant new initiative! 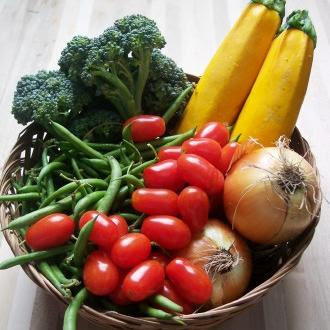 To get more of us off our couches - and into the garden - growing our own food. Nothing new to us here in Leabank Square - you might think - but please catch this program whenever you can - 'cos they make it so much easier!! Aaaaaaanyway - they also have literally millions of free seeds to give away - so please could I beg each & every Leabank Square resident to send off for one of these packages. Simply by sending off for it at: http://www.bbc.co.uk/digin/ - you will receive an envelope with 5 packets of seeds: tomatoes, squashes, beetroot,lettuce & carrot!! All for free!!! Please Leabank Square - let's get as many of these free seeds - and get some serious veggie gardening going on - right here in our square!!! As you can all see - the Olympic Welfare Centre for the construction site workers is taking shape directly opposite us. This will have all the amenities that the builders will need while they are constructing the International Press Centre and the Media Centre. I suppose it's full of stuff like offices, toilets, showers, canteens, sick bays, chill-out rooms - somewhere to shelter in a storm. It is an absolutely crucial building for the men & women building the Olympics. But it doesn't half look boring!! As some of you already know - we have been chatting to Julie King over the canal - and gave her a few ideas about making the view a bit more beautiful for us here in Leabank Square. This is a quote from her last email: "As you know the installation of the porta-cabins has commenced and we are extremely happy to place some form of artwork on the western exterior that faces Lea Bank Square as previously discussed with you. It would be useful if Gemma Rapson from my team could meet with you and possibly some other residents as soon as possible to gather your thoughts on an acceptable design. Once the porta-cabins are complete we will be placing trees along the embankment in front of the cabins to provide an additional screen. These will be approximately 5-6 meters tall and spread along the 50 metre stretch of cabins. These will be potted trees so their positioning can be altered if needed." This is just fantastic news!! So not only can we have some input into the artwork on the Welfare Centre facing us - but they are also going to plant some (hopefully evergreen) trees directly in front of it as well!! I know (through some of the emails on the secure system) that there are residents that are still very sceptical about what the ODA is doing for us. Hopefully we can all see that Julie & her team really are on our side - and do actually listen to us. Please can we see if we can knock our heads together over some suggestions for artwork - especially the front 3 blocks - as this directly affects them for the next 4 years. I know we all have a meeting overload in the next few months - but if we could all contribute some ideas up here on the blog - and through the specific artwork leaflets dropping through our doors - then a few of us can get these checked over by the ever-enthusiastic Gemma. 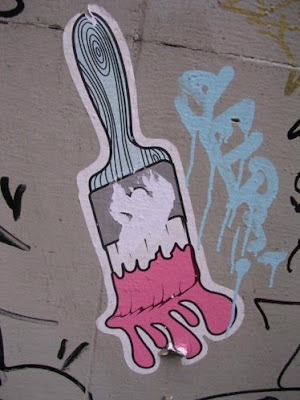 So - go on - get those creative juices flowing!! The more ideas we present to the ODA - the more of a chance we have of getting something we would actually like to look at for the next few years. Thanks to everyone who helped clear up the fly-tipped rubbish here in Leabank Square over the past few days! This year we have been plagued by many more fly tippers than usual. 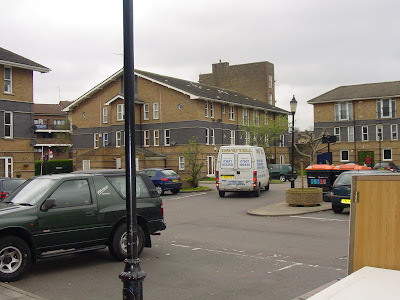 There are vans that are going around all the estates here in Hackney Wick - either stealing items from outside peoples houses - or dumping fridges, stoves, broken furniture & general rubbish! These are being done by the same people! I myself saw the white van above dump a fridge in our bin area - and then try & take our gardening tools from outside Z's door! I managed to get the tools back - but I couldn't get them to load their fridge back onto the van. 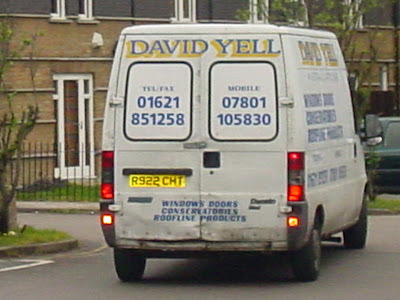 This particular van is quite regular - but there are certainly 3 more vans that I know of. I have sent some pics off to Hackney Council - and hopefully they'll get something done about them. But in the meantime - if you feel confident to challenge any fly-tippers or so-called 'scrap metal merchants' - please do. Remember - Leabank Square is Private Property - unless you have specifically called them to pick up some bulky rubbish - these people have no business in our square - especially if they are here to dump rubbish!! PS: Top marks to Z for scoring another few pics of the same bunch - in another van!! Sara Jones Thanked by Leabank Square!!!! A massive thanks to Sara for always being on call to pick up the fantastic donations Leabank Square gets offered!! Sara - without you (& Gwen) - Leabank Square would not have half the compost, plants, tools & equipment it has. Thankyou for being such a great friend - we really appreciate it. Leabank Square Thanks Jacqui Lewis!!! Take a look at these amazing plants?! Jacqui donated them both to Leabank Square today - and they are going to be so well looked after up on the riverbank! The Holly is the easiest to identify - with it's evergreen Xmas Card leaves. The other is a Pieris Japonica (Lily-of-the-valley bush) which flowers twice a year (Spring & Winter!). These two fantastic plants are going to make Leabank Square's Riverbank so beautiful for many years to come. When they eventually get too large for the containers - we can easily transplant them onto our green. Jacqui - thank you so very much for your stunning donation - please keep checking up on their progress here on our blogsite.